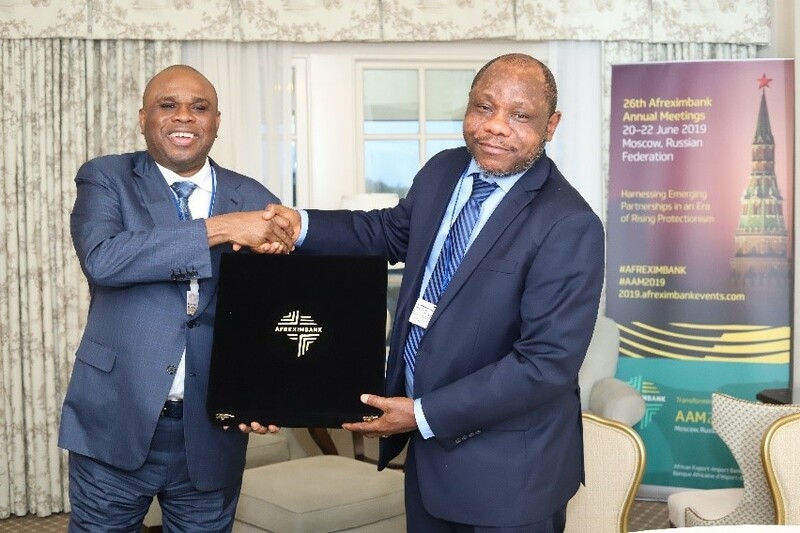 Afreximbank President, Prof. Benedict Oramah (L) presents Samuel Tweah, Minister of Finance of Liberia, with a gift during their meeting in Washington DC. The President of the African Export-Import Bank (Afreximbank), Prof. Benedict Oramah, in Washington D.C. at the head of a Bank delegation to the 2019 World Bank-IMF Spring Meetings, is taking advantage of the strong participation by African governments to hold high-level meetings with African leaders to discuss the work of the Bank in support of African economies. Yesterday, Prof. Oramah received Samuel Tweah, Minister of Finance of Liberia, who informed him that Liberia was facing challenges due to the pricing restrictions imposed under an IMF and World Bank programme which limited the number of programmes available to the country. Mr. Tweah said that the country had a number of projects in the pipeline for which it would seek the support of the Bank. 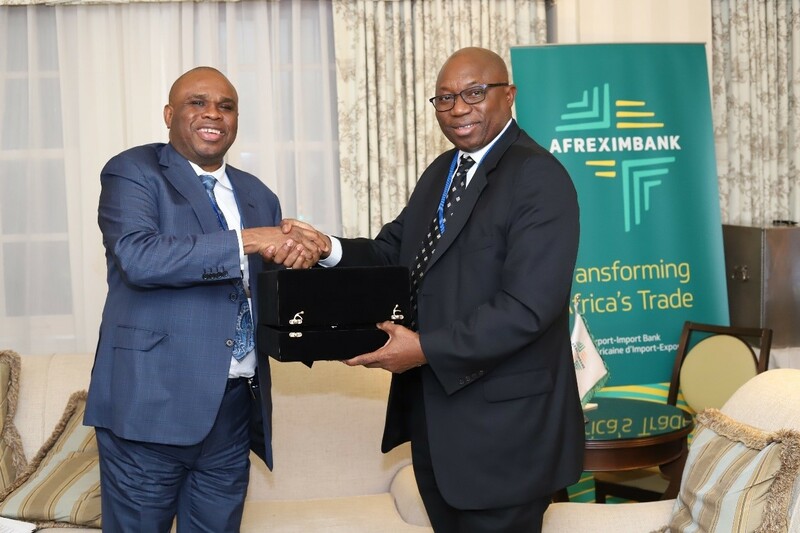 President Oramah assured the minister of Afreximbank’s readiness to assist its member states in executing such projects locally, regionally and across the continent. He then briefed the minister on the Bank’s performance and on its various interventions to support African economies, including support for the development of industrial parks and special economic zones, establishment of standards and certification programmes and promotion of the African Continental Free Trade Agreement. Afreximbank President Prof. Benedict Oramah (L) with Dr. Moeketsi Majoro, Minister of Finance, Lesotho, in Washington D.C.
Also yesterday, Prof. Oramah received Dr. Moeketsi Majoro, Minister of Finance Lesotho, who said that the government had been meetings with investors to identify projects that could be implemented in the country. Three hundred and ninety-nine project proposals were being considered out of which 77 were ready for implementation, said the minister. The investors came from Lesotho, South Africa and other parts of world and the projects covered such sectors as pharmaceutical, solar energy, mobile payment systems, cannabis and industrial hemp. The identified projects carried a value of 20 billion Maloti and would create about 30,000 jobs, he added. He requested the bank work with the country’s debt management office to identify further opportunities in the country’s textile industry, financing to technology companies and tractor manufacturing. 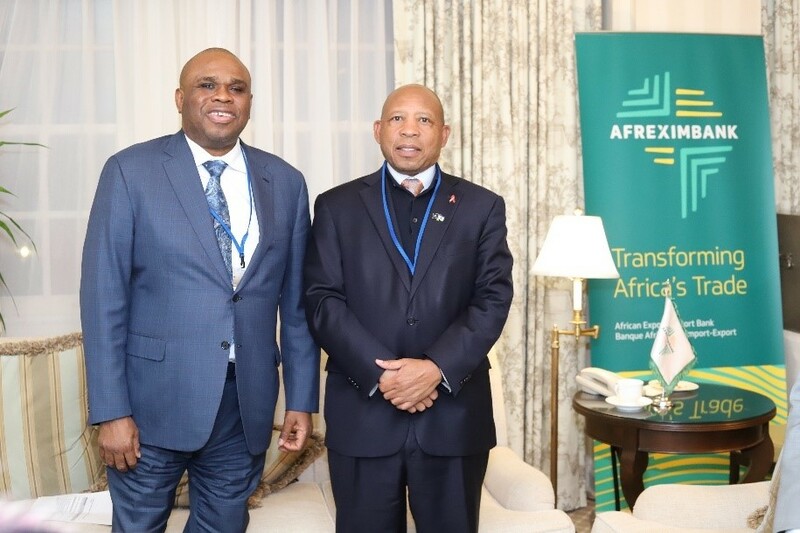 President Oramah noted that Afreximbank had attempted to support export manufacturing in Lesotho and that it had expanded its relationship with the Central Bank of Lesotho which had participated significantly in Afreximbank’s Central Banks Deposit Programme. Accompanying Dr. Majoro on the visit were Motai Ramokoinihi, Senior Planner, Ministry of Finance; Khotso Moleleki, Director, Debt Management Office; and Mafatima Moshoeshoe, also of the Ministry of Finance. Afreximbank President Prof. Benedict Oramah (L) hands gift to Marbury Nijie, the Gambia Minister of Finance, in Washington D.C. In a meeting today with Marbury Nijie, Minister of Finance of The Gambia, President Oramah heard that the government was encouraging independent power producers to come into Gambia to generate electricity and that hospitals and schools were being encouraged to use solar power. Mr. Nijie said that the country’s national debt-to-GDP ratio stood at 88 per cent and noted that the government is still subsidizing fertilizer in order to support the agrarian economy. He said that the Gambia needed financing for an improved road and rail network to be able to carry more volumes to support the re-export trade between Gambia and neighboring countries. Responding, Prof. Oramah assured the minister of Afreximbank’s readiness to support the Gambia in infrastructure improvement and other areas.